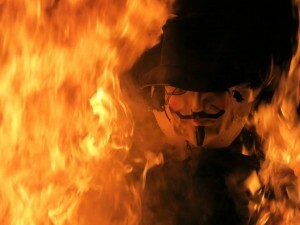 The 9th annual Guy Fawkes party! Big change this year: it is moving to the south side of the cities and it’s being co-hosted by the Fields Family near Northfield, MN (and the McCrackens). The format is the same as in the past. Bring a dish to share, a lawn chair, and your favorite libation. We will provide lemonade and coffee. Donations of fireworks are welcome. Dancing and singing encouraged! Come dressed for the weather!